After hundreds of submissions and nearly 10,000 online votes, diners can now try the The Big Pig as the featured burger of the week at Zinburger Wine & Bistro Bar, 6795 Springfield Mall, Springfield, Va., and the chain’s 11 other East Coast locations now through Sunday, Oct. 23. The upscale burger joint serves made-to-order burgers, salads, sides, chili, milkshakes and pie, as well as, wines by the glass or bottle, cocktails and beer. 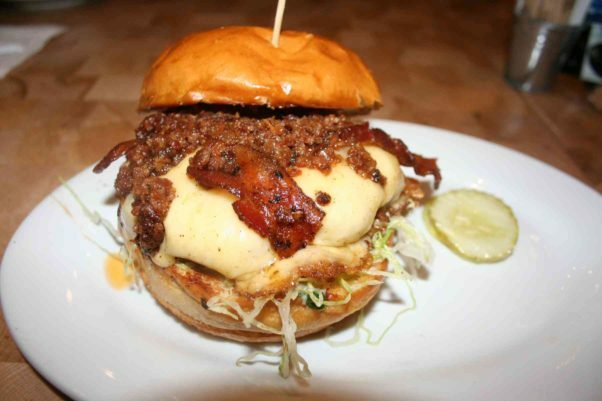 The winner of Zinburger’s fifth annual burger contest submitted by Doug Blankrot of Paramus, N.J., is an andouille and certified angus beef blended patty topped with Applewood smoked bacon, lettuce, bacon onion jam, smoked mozzarella and garlic mayo. It is priced at $16. It beat out two other finalists: the Florentine Burger, a seared salmon patty topped with sauteed spinach, mild herbed goat cheese, tomato and lemon dill mayo; and the Maker’s Queen Brie, a beef patty topped with sauteed onions, Bosc pears caramelized with butter, brown sugar and Maker’s Mark bourbon, brie and Maker’s Mark-infused ketchup. In addition to having his burger featured on the menu for one week, Blankrok received a $100 gift card. I got a sneak peek at the burger last weekend, but I’m not a big fan. The andouille gave the burger a little too much heat and the smokey flavor from the bacon and mozzarella combined to overpower the burger. But most of all, I did not like the bacon onion jam, which had a smokey, burned taste that masked all the burger’s other flavors. I ended up scraping as much of the jam off as I could, but the taste lingered. Better choices include the Breakfast Burger with fried egg, Applewood smoked bacon, avocado, American cheese, lettuce and mayonnaise; or the El Diablo with fried roasted jalapenos, pepper jack cheese, braised onions, lettuce and chipotle mayonnaise, which are $12.25 and $11.25 respectively. And the burgers come with only three pickle chips with sides sold a la carte. 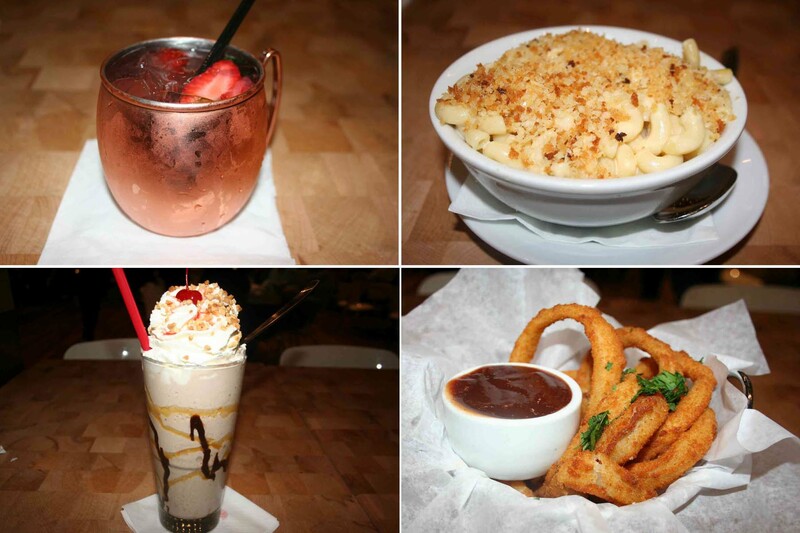 As for sides, choose the mac & cheese topped with toasted panko bread crumbs for $5 or the onion rings with barbecue sauce or zuchinni fries with parmesan and ranch dressing, both priced at $6. However, skip the $7 “loaded” fries, which aren’t very loaded with bacon, cheese sauce, sour cream and chives. While Zinburger offers a full bar with 24 beer selections including 16 on tap and local craft beers as well and a wine menu that includes 23 varieties priced from $5.50-$12.50 a glass or $21-$49 for bottles, I recommend the strawberry mule served in a copper cup made with vodka, strawberries, mint and ginger beer for $10. And for dessert, any of the $6 hand-dipped milkshakes including the Banana Royale made with vanilla ice cream, banana, brown sugar, caramel and Ghirardelli chocolate with fresh whipped cream, crushed peanuts and a cherry on top, or the $5 banana or chocolate cream pies. Zinburger is open from 11 a.m.-10 p.m. Sunday through Thursday and 11 a.m.-11 p.m. Friday and Saturday.